In this meeting management software review, we evaluated four web-based applications, MeetingKing, MeetingBooster, Less Meeting, and YAM as they are more aligned with professional use. Some meeting professionals may also consider ZippyMeetings and MeetingSense if they are looking for a more basic solution. The process of running a meeting and creating the meeting minutes is far simpler than using pen and paper or MS Word in all four of the meeting management software tools we evaluated. Since professional meeting management software is often used for corporate meetings, board meetings and staff meetings, this review is focused on the features that are most important to these areas. For a meeting management software program to be adopted in corporate use, it must integrate with systems that are considered standard in most organizations. MeetingBooster and Less Meeting were the only programs that had a plugin for Outlook. This is important for users to synchronize meeting calendar appointments between the 2 systems, and access contacts for invitations. MeetingBooster has further integration, with a complete ribbon in the Outlook interface. This allowed us to convert existing calendar appointments into MeetingBooster meetings as well as launch specific sections of the meeting tool such as the Agenda or Tasks, or even start the meeting directly from Outlook. MeetingBooster also had an Active Directory synchronization which we felt was a must for a corporation wishing to implement meeting management on a large scale. All four meeting management software programs included an iCal feed for attendees working with Gmail or other email clients. MeetingBooster was also integrated with popular screen sharing tools like GoToMeeting and WebEx. This allowed us to enter our corporate account information, and MeetingBooster created the meeting invitation, containing both the MeetingBooster and Webinar details. This was helpful since all meeting and screen sharing information was in the same invitation. Each of the meeting management software programs we evaluated allowed us to include standard meeting details, such as Meeting Title, Date, Time, Location and Attendees in the invitation. MeetingBooster and YAM allowed us to add a meeting purpose which we found helpful when creating the agenda, to help align the agenda with the purpose. It also gave us insight to determine if it was necessary to hold a meeting at all, meaning that if we could not define a purpose, maybe a phone call would suffice. Meeting tags are helpful when searching for meetings, and MeetingKing, Less Meeting and YAM allow this functionality. MeetingBooster took it a step further by allowing us to create a meeting series. This feature was useful in that the relevant meetings were automatically grouped. This allowed us to quickly invite a predetermined attendee list to the meetings in that series, and the meeting minutes were grouped for easy review of the series of meetings. For task management, this feature allowed MeetingBooster to do better job in overviewing action items that have been assigned during several meetings belonging to that series, especially when running one of the meetings in that series. MeetingBooster was the only meeting management software that had a specific Meeting Agenda module. The others used the same module for creating the agenda and taking the minutes. We found that the Agenda module forced us to pre-plan the topics before running the meeting. This helped to manage the meeting time better since we were prevented from adding topics on the fly, thereby going over the original meeting time. MeetingBooster’s Pre-meeting Task feature proved advantageous, helping attendees prepare for the upcoming meeting. We could even assign a pre-meeting task to a specific agenda topic and review the tasks status before the meeting. This is great for accountability. The MeetingBooster’s Agenda module was very MS Office friendly, including a ribbon system like a standard MS Office tool which made the agenda building process easy to understand. MeetingKing, Less Meeting and YAM use the same module for the agenda and for note-taking. Our initial impression was that this was more flexible, but after further use, this proved to cause the meeting to stray from the original agenda too much. We found ourselves adding topics on the fly and our discussions continuously moved away from the original agenda. MeetingBooster did a nice job of separating notes and tasks when running the meeting. To create a task, MeetingKing, Less Meeting and YAM force users to convert a note to an action item, making the minutes look cluttered since everything was grouped in one section. MeetingBooster’s Notecard allowed us to pick who said what from a list of attendees. The others forced the note taker to type the attendee name which made the note taking process cumbersome. MeetingBooster’s Notecard worked similar to MS Word and allowed us to format the notes and add attachments or hyperlinks to support the topics and conversations. MeetingBooster also separated the notes per topic rather than having one continuous list. We could still get an overview by previewing the minutes. All of the meeting management software tools allowed us to add a conclusion statement, however MeetingBooster implemented a Conclusion Statement feature which will be covered in the Minutes section of this review. MeetingBooster and YAM’s Meeting Tools can be used during the meeting to facilitate decisions on topics. At first review, YAM’s tools seemed promising, however after further study, all the tools seemed to function the same, but with a different name. The results of the tools were not displayed clearly in the notes, making it difficult to see the positive impact of using the meeting tools. MeetingBooster’s set of tools worked independently of each other. The Voting and Pro / Con tools were very powerful, simple to use and the results were listed clearly in the notes. This made the review process better. Parking a topic is a must have feature for a meeting management software tool and MeetingKing, Less Meeting and YAM allowed us to only park main topics, whereas MeetingBooster let us park topics at any level. The feature also worked as a navigation system allowing us to review or navigate to the parked topics in the notes. All four meeting management software tools allowed us to easily include the parked topics in a future meeting's agenda. Meetings lead to decisions and decisions lead to actions. MeetingBooster was the only meeting management software tool with a true Task Management system. The others make you enter task information as you would a note which made the meeting minutes very cluttered since the tasks were in line with the notes. Reviewing and updating tasks specific to owners or to a project was much easier in MeetingBooster. All four meeting management software tools allowed us to receive and update tasks. MeetingBooster also allowed us to create a task at any time and assign it to a resource or meeting. We found this beneficial in case you forgot to assign a task when running the meeting. MeetingBooster’s Project Label feature allowed us to group tasks within a label making it easier to review tasks that span across several meetings. The others allow for a tag, which was something you typed in on the fly. In MeetingBooster you create specific project labels and invite users to access the contents of the labels. For corporate use, task tracking is then streamlined rather than having users tag the tasks as they see fit. Further, in MeetingBooster, only users authorized to see the project label can review its content. All four meeting management software tools automatically created the meeting minutes, however the results were very different. YAM utilized an email style with minimal formatting making it very difficult to review. MeetingKing, MeetingBooster and Less Meeting automatically formatted the minutes, however MeetingBooster and Less Meeting had more options. MeetingBooster supported 3 minute styles and 3 layout options. We found this to be more productive in a corporate setting. MeetingBooster also included a branded cover page and an optional signature page. These additions meant that MeetingBooster created the most professional meeting minutes document out of the four meeting management software tools. We mentioned MeetingBooster’s Conclusion Statements feature earlier, however it deserves further explanation. The benefit of adding a conclusion statement rather than just a note is that it is reflected when reviewing the minutes. We were able to toggle between discussion or conclusion-style minutes which listed either the entire conversations or just the conclusions. This made the minutes review process much easier for management. Most meetings are adjourned prior to the minutes being perfected. This means that users need to edit the minutes after the meeting. We felt that there needed to be some time limitation here, and MeetingBooster was the only meeting management software tool that had a time limit on editing the minutes, specifically 14 days. Since this is a review of professional meeting management software tools, we found this to be an appealing feature, important for legal compliance and corporate requirements. All four meeting management software tools made distributing the minutes easy. However YAM sent the minutes out in the body of an email with minimal formatting, making it very difficult to review. MeetingKing, MeetingBooster and Less Meeting offered automatic distribution with a PDF option, supporting the formatting of the minutes. MeetingBooster’s Viewer Access feature allowed us to grant specific users permission to view the minutes. This was helpful in instances where they could not attend the meeting or for managers, executives or new employees to be brought up to speed on a previous meeting's information. MeetingBooster’s archiving system was the most robust out of the four meeting management software tools we reviewed. MeetingBooster is built around a permission system, much like a CRM System. This ensured that I could only see what I was granted permission to see. For corporations, security protocols are a must, and MeetingBooster was also the only true cloud-system. Each company’s data was stored on a separate server rather than storing all companies information on the same one. Less Meeting and MeetingBooster both host the data through Microsoft Azure, however MeetingBooster uses individual servers per company and an advanced SQL database. This added a second and third level of security which some organizations are required to implement. MeetingBooster also offered a local hosting option, allowing a company to install the system on their servers, eliminating the risk of a data breach from an outsourced hosting facility. Searching for past meeting data is essential and all four meeting management software tools had a search function. MeetingBooster’s search could be done per screen or as a system wide search. This helped us to find more relevant information and we could even select specific search results and merge them into a consolidated PDF document for review and archiving. Dashboards help with transparency of meeting data and effectiveness. 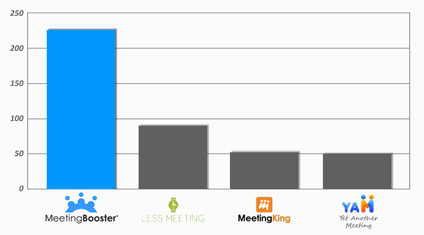 MeetingBooster and Less Meeting were the only meeting management software tools that offered dashboards. Less Meeting’s dashboards seemed to review individual meetings, offering basic reporting on the meeting. MeetingBooster’s dashboard suite allowed us to review an individual meeting or multiple meetings. We could track things like costs, host and attendee performance, task status and even compare individual users or divisions with each other or the company average. One of our favorite reports in MeetingBooster was the Cost report. This showed the cost of meetings based on the attendees that were invited and the time spent. With the right permission access, we could see how many meetings you had over a time span, how much it cost the company in salary to have the meetings, and exactly how much it costs to have specific attendees at the meeting. Again this was based on the permission we were granted, so we could not see what were not authorized to see. Feedback helps improve meetings, and MeetingKing, Less Meeting and MeetingBooster allowed for feedback on the meetings. MeetingBooster’s feedback system was much more in depth specifying the frequency and type of rating systems to be used. The system randomly selected attendees and tracked the responses over time. These reported both qualitative and quantitative data which was then used to generate feedback and performance reports. All four meeting management software tools required user logins and passwords. MeetingBooster was built around a permission system that functioned much like a CRM system. Here a system administrator would configure the account, setup security roles and assign the roles to specific users. This determined what they could or could not do in the system, as well as what data they were authorized to see. With corporate security requirements escalating due to things like HIPPA and the HITECH Act, we found this to be a very appealing feature for a true enterprise solution. The conclusion of this professional meeting agenda software review is that all four applications provide impressive features and all four would be a good addition to any corporations meeting agenda process. MeetingBooster scored highest in this review because of its MS Office style friendliness and powerful productivity features like agenda templates, time distributor and pre meeting tasks. Above all, MeetingBooster proved to be more of a corporate level tool, whereas the other reviewed tools seemed to focus on smaller size organizational meetings.